Graphic designer and typographer, Luca Ionescu approached 3D Systems Asia-Pacific for a 3D printing solution to produce a long-lasting 3D sculptural piece for an upcoming exhibition. Digitization has opened up typography to new generations of visual designers and lay users. 3D printing is an additive technology that prints three-dimensional objects to a layer at a time out of a variety of materials such as plastics, metals, nylon and flexible variations. 3D printing of typography brings a whole new level of creativity and imagination. Luca Ionescu approached 3D Systems Asia-Pacific to push the boundaries of technology in 3D printing of his ‘Steady As She Goes’ typography art piece. The objective was to produce a long lasting 3D sculptural piece to showcase at the ‘There Goes The Neighbourhood’ exhibition at The Tate Gallery in Glebe. 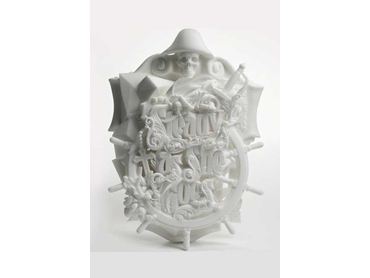 The art piece was produced on 3D Systems’ Selective Laser Sintering (SLS) sPro 60 printer using DuraForm PA plastic material. SLS technology is perfect for recreating durable shapes with intricate details and complex geometries such as for typography art pieces. 3D Systems Asia-Pacific is a leading provider of content-to-print solutions including 3D printers, print materials as well as prototyping and manufacturing services for professionals and consumers alike.